Paul Stewart is fondly remembered by Manchester City fans of a certain vintage. 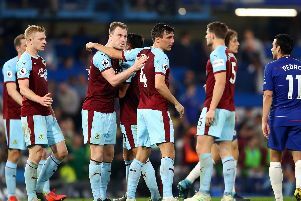 But, ahead of Saturday’s FA Cup clash at the Etihad, he looks back on a brief spell on loan at Burnley, which wasn’t as well received by Clarets supporters. Stewart, now 54, started his career at Blackpool, before earning a £200,000 move to City in March 1987. He hit two goals in 11 appearances as City were unable to beat the drop fromthe top flight, and had netted 28 in 52 games the following season as the Blues were unable to bounce back immediately. That earned a £1.7m switch to Spurs in the summer of 1988, where he went on to score in a man of the match performance in the 1991 FA Cup Final win against Nottingham Forest, and earn three England caps under Graham Taylor. He joined Liverpool for £2.3m in 1992, but would only score three goals for the Reds. And Stewart’s life was spinning out of control when he signed for Burnley. The Clarets, back in the second tier in 1994-95, were tumbling out of the old First Division when Jimmy Mullen brought him to Turf Moor on loan from Liverpool. “It was the lowest point of my football career when I was at Liverpool,” said Stewart. But Stewart stepped into another nightmare, seeing red in a 2-0 defeat at Barnsley on a bone-chilling March night at Oakwell, and he was back at Anfield before his loan was up. “I was a bizarre scenario at Burnley, and I had a very rough time there. “I wasn’t fit, and I was depressed. “When I was sent off at Barnsley I got so much stick from the fans, I gestured to take my shirt off and throw it to the crowd. “It wasn’t the wisest thing to do in front of Burnley fans and I didn’t endear myself to them. “I wasn’t Mr Popular I can tell you. A year later with Mullen gone, Stewart received an unexpected call from Adrian Heath, the new man in the Turf Moor hot seat. “Inchy (Heath) said: ‘Do you fancy coming back to Burnley? The following day a newspaper ran a story with the headline: ‘Stewie back to Turf Moor ? “Inchy called me back and said: ‘Listen Stewie we’ve had hundreds of complaints from fans saying that they would burn their season tickets if you darkened the door again.